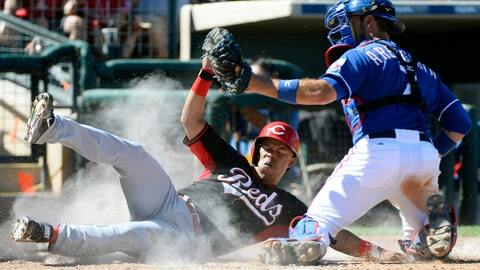 Cincinnati Reds second baseman Ramon Santiago (left) is tagged out by Texas Rangers catcher J.P. Arencibia during the fifth inning at Surprise Stadium. SURPRISE, Ariz. (AP) — Yu Darvish pitched five positive innings and Jurickson Profar homered as the Texas Rangers beat the Cincinnati Reds 8-2 Monday. Darvish allowed two runs and five hits, striking out one without a walk. Darvish retired the first nine batters he faced before yielding RBI doubles to Jay Bruce in the fourth and Ramon Santiago in the fifth. "My game plan was to throw a lot of fastballs, two seamers, and let them hit the first pitch," Darvish said through an interpreter. Profar homered off Reds starter Homer Bailey in the third and ranks second in the Cactus League with 11 RBIs. Bailey, who signed to a six-year, $105 million contract this winter, gave up two runs on three hits, while striking out five and walking none. "Probably a B-plus," Bailey said of his performance. "The one pitch to Profar he hit out, it was a 3-2 slider and I had to come with a lot of the plate. It’s probably not something we would do a lot in the season, but it’s a good time to do those kinds of things. The Rangers seized the lead in the fifth on Elvis Andrus’ two-out, two-run single. Adam Rosales contributed a two-run single in the Rangers’ four-run fourth off Curtis Patch. A throwing error by Zack Cozart started the inning. Both runs off Jeff Francis unearned. Bailey threw 39 strikes in 58 pitches. "We were ahead of a lot of guys it seemed like, so that’s a good time when you can start working on things, your touch on secondary pitches," Bailey said. "No walks, that’s a big plus,"
Darvish averaged just more than 12 pitches an inning against the Reds. "I want to go more innings this year," Darvish said. "If I throw my pitches in the strike zone, I’ll think I’ll be able to accomplish it." "He was real economical," Rangers manager Ron Washington said. "Today he pitched off his fastball. I didn’t see a whole lot of breaking balls. He was getting ahead. They put four pitches in play on the first pitch. "I hope this is a trend where they put balls into play early," he added. "That gave him a chance to get through some quick innings. He’s not trying to get weak contact. He’s throwing his game. He’s using the fastball, putting it over the plate and commanding it a little more, which means they are going to be swinging a little quicker." Left-hander David Holmberg (bruised right shin), who has appeared in only one game, is scheduled to throw Tuesday against minor leaguers. Reds center fielder Billy Hamilton struck out to leadoff the game. It was Hamilton’s first strikeout in 21 plate appearances this spring. He has struck out at least 100 times in his past three minor league seasons. Hamilton led off the fourth with a bunt single and scored from first on Bruce’s double.